Hi guys, this is my latest work. 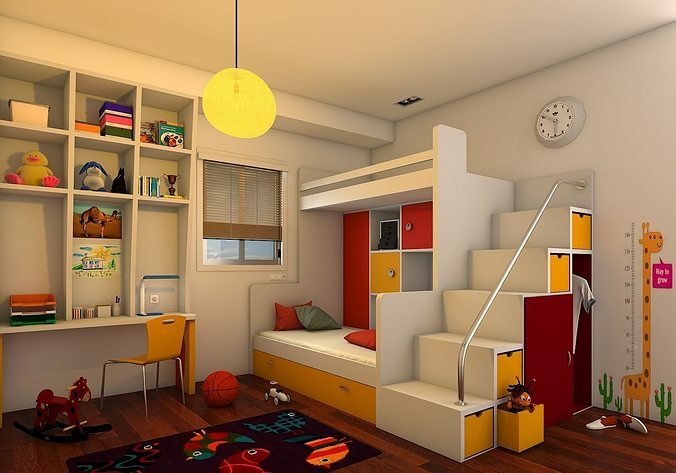 This 3D model of Modern Kids Bedroom created on real base, with all textures and materials. It is ready to use, just put it into your scene. It’s created accurately, in real units of measurement. This product was created in 3dsMax 2013, Preview render made with V-ray 2.3. And there is no any Post-Production with PS. This is the final rendered image by 3DsMax. Textures included in the 3ds Max zip file. Please feel free to contact me if you have any questions. C & C are most welcome!!! Hi, I'm interested in buying this model. I have a question, the .max files have modifiers (turbosmooth, edit poly, etc.) Greetings. Hi, I would like to thank you for your interest in buying this model. There is no modifiers like turbosmooth or editpoly.